I was given the opportunity to participate in a panel discussion at Paris Photo this week. It was a group made up of established members of the fine art photo community, led by Rick Wester, a well-known gallerist and former auctioneer. Lisa Erf, curator of the highly respected JP Morgan collection was also on the panel, as was Victor de Bonnecaze, from the Galerie Daniel Templon. This year Templon dedicated its entire Paris Photo selection to Staged Photography, my favorite sub-genre within the world of photography. Also on the panel was Vanessa Hallett from the auction house Phillips, where she is the Senior Director and Worldwide Head of the Photographs group. Finally, we were joined by Sondra Gilman and her life-partner Celso Gonzalez-Falla, who began collecting photography in 1955. 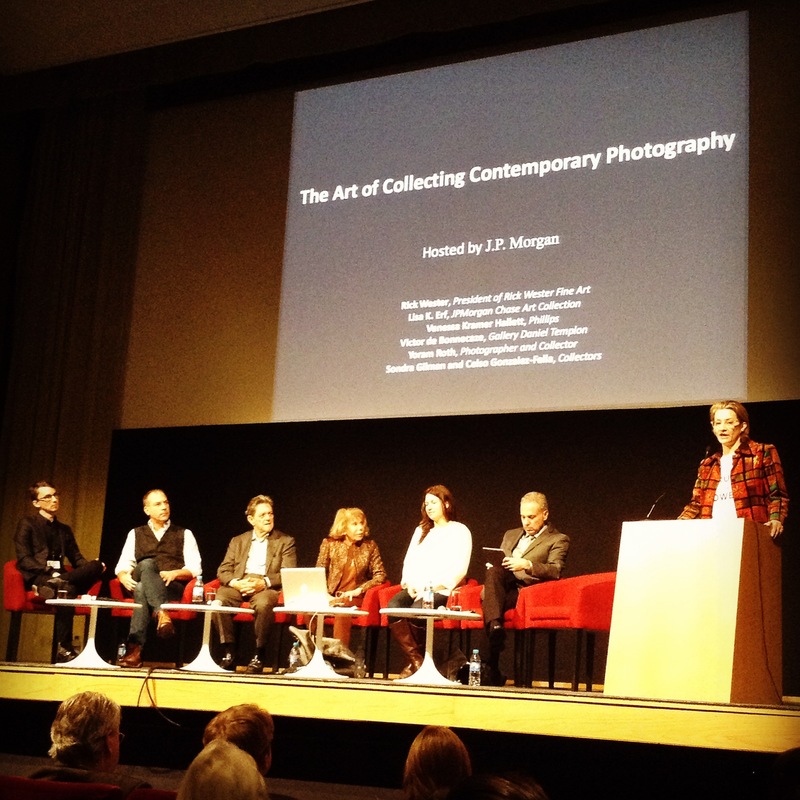 The goal was to discuss how technology has changed the process of collecting photography. We spoke about the ways it’s becomes easier for a gallerist to show collectors an artist’s work beyond the gallery space, and how artists are able to maintain their own web presence. We also touched on the problem inherent to image overload. Art work is all over the internet without attribution to artists, never mind the galleries where a viewer might buy such an image. Some art blogs, like the Staged Photography Tumblr do a good job of attributing the artists to the respective work, and even identifying distinct series. I explained that I use social media and my blog as a tool to stay in touch with people who like my work, and to share some of the thought process and the production that goes into my work. I don’t simply feed images into the ether. Simply put: Facebook “Likes” may be fun, but they don’t necessarily translate into work that makes it way into curated collections or people’s homes. Another problem is scale. Even the largest monitor is not as big as many pieces of contemporary fine art photography. This matters a lot, because the eye travels through an image differently according to size. Elements within a picture have a certain relationship, and they take on different levels of importance if they cannot be seen within the same field-of-view. Consider a portrait, for example. I can view it on a monitor, and can focus my interest to a specific part of the face. But a huge portrait on a wall doesn’t permit me to see the whole face at once unless I step way back, and a normal viewing distance forces me to look at it the same way I might explore a landscape… I see an eye, a mouth, the line of the hair… but not the whole face. This is an important and powerful part of photography. I think we missed a real opportunity though. I tried to broach the topic of technology in the creation of new work, but it didn’t make its way into the broader conversation. I believe it matters, but more traditional collectors still think about photography and the underlying collecting process as something based on paper prints. But contemporary photography doesn’t require a film negative, nor the positives that are made from it. There are artists who use digital technology as a primary tool in their work. Ruud van Empel and Simen Johan are both artists who are deeply involved in digital collage, one more overtly than the other. Other artists such as Erwin Olaf or David LaChapelle fine-tune their image using digital post-production. But most importantly, contemporary artists have a myriad of display materials available to them. We can use a large selection of surfaces on which to print images. I have seen artists print on linen, leather, cardboard, aluminum, and all kinds of paper that is then bonded to glass or acrylics. I use a combination of waxed paper and a difficult-to-use matte acrylic in combination, and neither the material choice nor the production pathway would be an option if I didn’t have the proper technology available to enable it. You can read about my process in a previous blog post. Unfortunately, at Paris Photo I also saw a number of photographers use material that I consider inappropriate for the image or its subject. Some images work well on a light box, but many do not. Another material which is frequently misused is acrylic Diasec, which is an incredibly rich and glossy material that brings out contrast and saturation within a picture, but is also quite reflective. Nuances are lost when an image has to compete with the elements reflected from the room in which it hangs. I was able to make this point to collectors: the new materials are one more reason why you really have to see the work in real life. No matter how good an image looks on a screen, the ultimate choice made by the artist trumps all prior efforts. No matter how good the work is, the wrong presentation will kill it. A print needs the proper frame, a passe-partout, and some museum glass, but contemporary photographic art is more complex than that. A photographer can focus on taking pictures, but an artist has to make creative choices all the way through to the final piece.